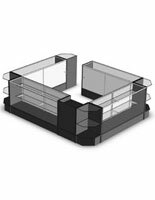 This glass cash wrap offers a great deal of features for a store's floor layout. First off, this configuration is big: approx. 11' x 19'. Your interior needs to be big enough in order to accommodate a fixture such as this. 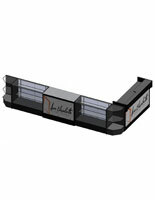 The glass cash wrap comprises 10 pieces of mostly tempered glass showcases. We include one register stand in black melamine. 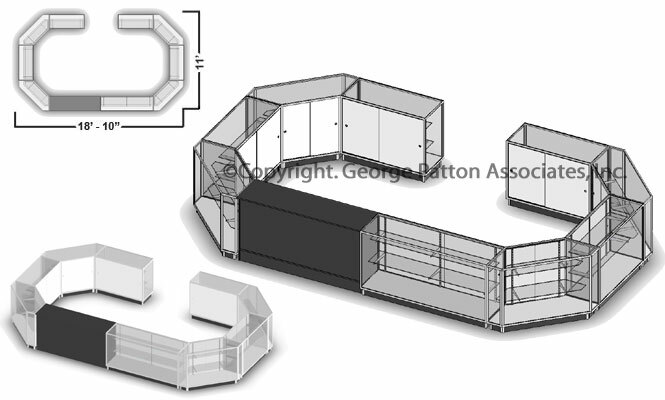 For the showcases, each comes with adjustable shelving and sliding rear doors. Security locks are included with each fixture. 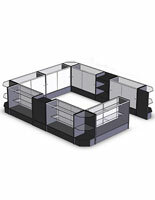 The glass cash wrap provides one open section to allow salespeople in and out of the oval. 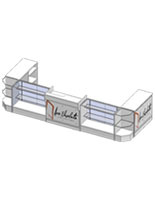 Based on its design and purpose, it is vital this store counter be placed centrally inside your establishment.